Dhaka, May 15 (Just News): Bangladesh Nationalist Party secretary general Mirza Fakhrul Islam Alamgir on Wednesday expected that the jailed party chairperson Begum Khaleda Zia would be freed before the Eid-ul-Fitr. 'We don't think that Madam (Khaleda) would remain in jail till Eid. She definitely will walk out from the jail before the Eid. It is our belief,' Fakhrul said adding that as per existing law of the land it should happen. Fakhrul came up with the remarks while talking to journalists at Khaleda's Gulshan office in the evening. The secretary general said the six cases in which Khaleda Zia has been shown arrested were 'baseless'. He said they would move to the High Court for securing bail in those cases and overcome the issue of shown arrested within seven to 10 days. Fakhrul also hoped that appeal filed in the Supreme Court challenging the lower court's five years jail to Khaleda Zia would go in favour of the BNP chief. Because Khaleda Zia was not involved any way in the Zia Orphanage Trust case, he said adding that the prosecutors could not prove the allegation of breaching of trust by her. Replying to a question, Fakhrul said that they were shocked at the Supreme Court Appellate Division's staying bail order granted Khaleda by the High Court. Khaleda was deprived of her right and as a result she has to stay in jail three months, he said. 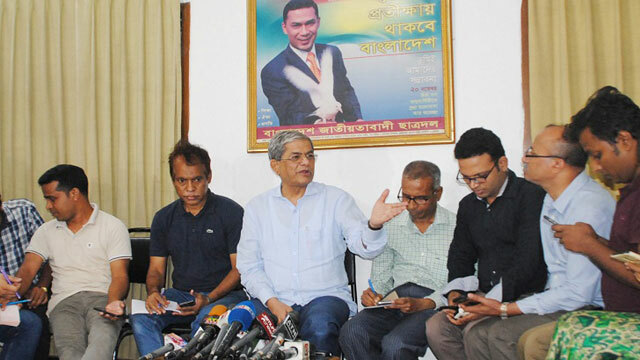 Asked about whether BNP would take part in local government elections particular Gazipur mayoral poll scheduled for June 26, Fakhrul said after the latest experience from Khulna city mayoral polls no election would be fair and neutral under the present government and the Election Commission. He, however, said the party would discuss on this issue anew to take decision and take new strategy about the Gazipur civic poll. Fakhrul said the Election Commission should resign.